BETHESDA, Md., Jan. 4, 2017 – ROSS Management Services, a leader in multifamily property management in the Mid-Atlantic region, today announced it has assumed management responsibilities for six apartment communities with 1,140 units in suburban Washington, D.C., southern Virginia and New Jersey. The communities are a mixture of affordable and market-rate properties. The management assignment represents ROSS’s entry into the New Jersey multifamily market and an expansion of its southern Virginia portfolio. The communities include the 90-unit 1118 Adams in Hoboken, N.J.; the 144-unit Clearfield Apartments in Colonial Heights, Va.; the 552-unit Cottage Grove in Newport News, Va.; the 100-unit Largo Center Apartments in Upper Marlboro, Md. ; the 144-unit Pinetree Apartments in Petersburg, Va.; and the 110-unit Vistas at Lake Largo in Upper Marlboro. A new client of ROSS’s, Beachwold Residential, owns the communities. ROSS will implement operational upgrades, such as online and mobile rent payment, service requests and account management, to improve the resident experience, The company also will incorporate its award-winning online reputation management program to strengthen the communities’ reputations on sites such as Yelp, ApartmentRatings and Google, and will significantly enhance the communities’ marketing and advertising campaigns. 1118 Adams uses the federal Low Income Housing Tax Credit program to provide two- and three-bedroom units for families who make 60 percent or less of the median income in the Hoboken area. The six-story community is designed in the brownstone style prevalent in Hoboken residential neighborhoods, and won a 2006 Best in American Living Award from the National Association of Home Builders. Clearfield Apartments has an income restriction and accepts housing vouchers. The community is just minutes from Southpark Mall, Fort Lee and White Bank Park, which is on the Appomattox River. Community amenities include 24-hour emergency maintenance, a brand-new fitness center, pet park, volleyball court and swimming pool. 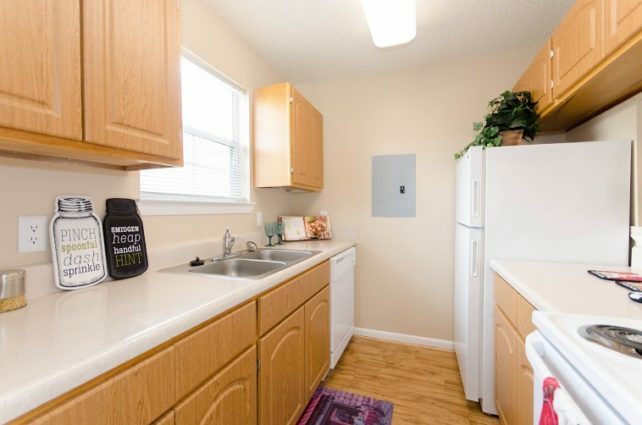 The apartment homes feature new cabinets and appliances, digital thermostats, oversized closets, washer and dryer connections and two full bathrooms in each. The market-rate Cottage Grove is near I-64 and I-664, as well as downtown Newport News and numerous shopping and dining destinations. The community participates in the Rental Partnership Program, which provides military personnel with affordable off-base housing, and features a swimming pool and playgrounds. Cottage Grove offers one-bedroom, single-level cottages and two-bedroom townhomes. Each apartment home boasts a gourmet kitchen, private patio, energy-efficient heat pumps and windows, and most have hardwood floors. Largo Center Apartments is an income-restricted community near I-495, which allows residents to travel easily through the Washington, D.C., area. It also provides close proximity to the Largo Town Center shopping center, FedEx Field, The Boulevard at the Capital Centre open-air shopping center and outdoor bike paths. The community features one-, two- and three-bedroom apartment homes. In-unit amenities include wall-to-wall carpeting, spacious bedrooms, walk-in closets and breakfast bars. Largo Center also offers controlled access entry, a walking path, swimming pool and off-street parking. Pinetree Apartments is an affordable housing community offering one-, two- and three-bedroom apartments. It is near Fort Lee, Southpark Mall, I-95, I-295 and Route 460. The homes feature fully equipped kitchens, washer and dryer connections, patios or balconies and vaulted ceilings in select units. Pinetree also has a swimming pool, community room, laundry facility and playground. The Vistas at Lake Largo offers one- and two-bedroom affordable apartment homes for active seniors. The community features a theater room, on-site barber shop/hair salon, fitness center and community room. The apartment homes include emergency pull cord systems in the bedrooms and bathrooms, modern finishes and fixtures and wall-to-wall carpeting. Vistas at Lake Largo is near the Largo Town Center and The Boulevard at the Capital Centre open-air mall. ROSS Companies, founded in 1983 in Bethesda, Md., is a recognized leader in multifamily acquisitions and investment, development, property management and renovation. With a managed portfolio of more than 14,000 apartment homes in more than 45 communities, the privately held company is one of the most active multifamily real estate firms in the Mid-Atlantic region. ROSS Companies is comprised of three affiliates – ROSS Development & Investment, ROSS Management Services and ROSS Renovation & Construction. In 2016, ROSS Development & Investment is celebrating its 33rd anniversary and ROSS Management Services is celebrating 28 years in business. In March, ROSS Management Services was honored for the second straight year with a National Resident Satisfaction Award from SatisFacts. In 2016, 12 ROSS-managed apartment communities were awarded the Apartment Ratings’ 2015 Top Rated Award, reflecting ROSS Companies’ unwavering commitment to customer satisfaction. These annual awards recognize communities with outstanding resident satisfaction ratings as measured on ApartmentRatings.com. For more information about ROSS Companies, visit TheRossCompanies.com.